Advanced Kill Moves unlocks every stable kill move to every fitting weapon or weapon combination. Source code for the scripts is included. 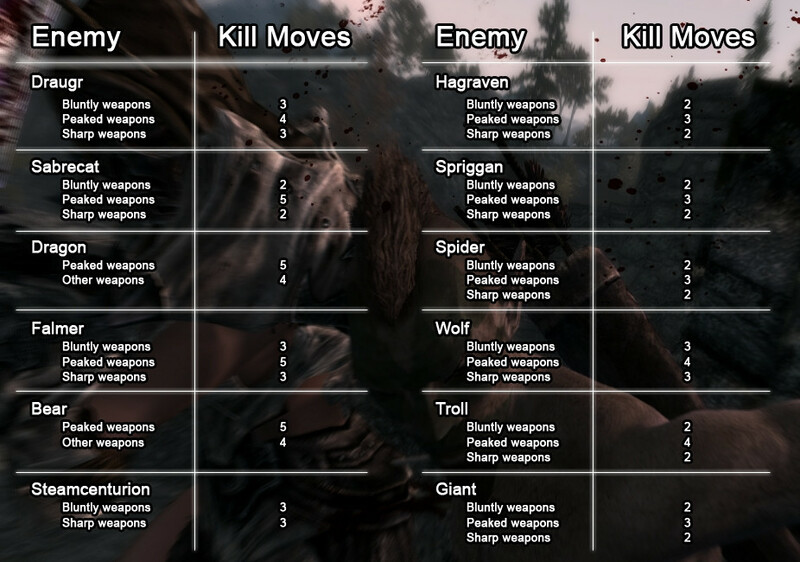 Added new KillMove option "KillMoves", to be able to use vanilla kill move structure. Fixed ViewMode bug. Learning will now remember if you chose not to reset view modes. Reworked all scripts from scratch. Improved performance of all scripts. Significantly improved ViewMode Learning option. Fixed bugs in the camera data. Reworked the whole camera paths section. Fixed bug with 3rd person kill moves and 3rdPerson Mode when playing in 1st person. Reworked static 3rd person kill cam for "3rdPerson Mode". Added new features "1stPerson Mode" and "3rdPerson Mode". Added better description to the info.xml, which is shown in NMM. Fixed different text issues in the multilanguage string files. Completed french translation of the book. Changed the mod titles in "AdvancedKillMoves English Only" and "AdvancedKillMoves Multilanguage ( ENG, GER, FRE, RUS )". "MoveShake" now working better, small shake-pause may still be possible. Added "MoveShake" when riding a horse. Changed default killcam option to "Standard". Fixed some missing text issues. Corrected misplaced text in ReadMe. Added russian string files. Thanks to Steelsnap aka TheWiseCat and DJ_Kovrik. Added new features from v1.7 to the AKM book, I forgot that in the v.1.7. Updated the ReadMe with the new features. Implemented new camera feature "MoveShake". Implemented new special feature "nknight2084 punching option". Implemented new common feature to drop and return the book. Saved esp file of the multilanguage version without compression. Removed compression from language string files. New attempt to fix the hand 2 hand problem. Added new feature "SoulGem Checker". Added new feature "SoulGem Checker" to the book, book text and setup wizard. Reworked decap option in book. Added wizard to the book ( No ... not a magician XD ). Fixed sneak- and back attack conditions. Reworked the quest script for better performance. Added the new ViewMode option "Learning" to the book text. Added new ViewMode option "Learning". Fixed left hand magic kill cam. Hopefully fixed dragon kill move bug. Introduced new KillCam option "ViewMode". Introduced new Special-settings category in book, including the "ray_314 sneak option". Reworked text of the AKM book. Added one handed axe to the sneak conditions. Fixed H2H kill moves not being triggered correctly. Fixed H2H 3rd person problem. Added two H2H kill moves. Added two dual attacks to all attack branches. Fixed problem with deactivated mid combat. Included a detection of warhammers into the quest script. I removed the changes of the player actor and bound the script to a quest alias inside the AKM quest. Fixed broken possibility conditions in bleedout animation data. Implemented kill moves to dual attack data. Fixed the possibility to execute kill moves when blocking. Changed the default player name from "Gefangener" to "Prisoner". Fixed a bug causing sneak attacks to only be possible with certain weapons. Fixed the text error in the new ViewMode option saying "Toggle" when "Standard" was activated. Fixed broken kill moves missing first person animations. Added automatical View-Mode-Change feature to the mod. Fixed camera bug with ranged kill moves, nothing else changed to ranged kill moves. Replaced condition function "GetRandomPercent" with my own random number calculation including a combat check. 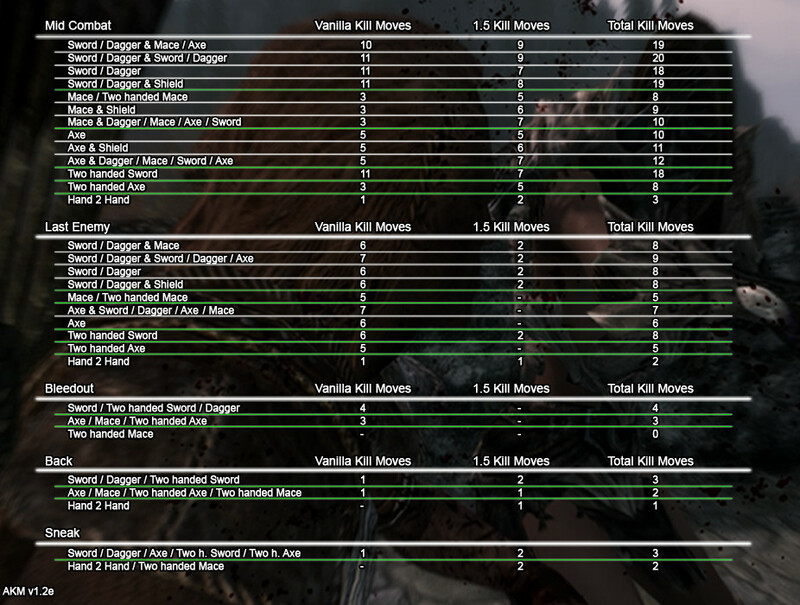 Added new v1.5 kill moves. Added kill move data to power attacks, left hand for duals, and left hand power attacks for duals. Fixed kill moves on essential NPCs. Not longer possible, especially decaps. Removed parent folders in 7zip file. Added perk condition to one handed axe. Fixed some issues in the animation data of one handed maces. Added hint for default kill move chance in the book. Added mid-combat check for non-human enemies. Reworked kill moves for non-human enemies. See in features. Fixed problem with dragon kill cams. Fixed problem with immunity to kill moves on dragons. Added immunity conditions to dragon kill moves. Added new script to initially add the book. Added new script which will re-add the AKM book if dropped. Auto-add script removed and placed the AKM book at Belethors store to buy. Updated the book and message text regarding the decap option. Added decapitation perk conditions and possibility to unlock the decapitation for two handed swords and two handed axes. Added some text to the AKM book, explaining the options. Fixed auto-drop feature and implemented an real update-notification. Added option to change kill move chance. Added option to disable mid-combat kill moves. Added option to disable kill move splitting. Fixed player immunity. Should be working now. Added possibility to change kill cam and player immunity to kill moves. Added two books to configure. 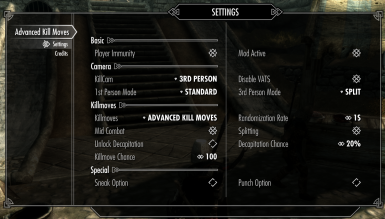 This mod unlocks all stable killmoves to all fitting weapons or weapon combination. The Identical to Master edits are intentional and needed for the mod to work. Unlocks every stable animation to every fitting weapon or weapon combination. Unlocks kill moves to: left hand attacks, left hand power attacks, dual attacks and dual power attacks. Fixed some bugs in mcm menu. There were still some leftovers from version 2.0b and a drity edit. Added option to disable mod. Added option to disable VATS ( INI Setting: bVATSDisable ). Removed "ViewMode" option for killcam. Removed leftover from version 2.0b. After I tested the features and before I uploaded the mod I cleaned it withh TexVEdit. That was a big mistake, because it completely destroys some of the camera features. Don't ever clean this mod with TesVEdit XD. With the following settings even ranged mid-combat kill moves are possible. Easiest way is to install with Nexus Mod Manager. Just remove the .esp and the two scripts starting with "AKM". The mod heavily changes animation- and camera-structure, so I'm afraid it is most likely incompatible to most, if not all, other kill-move-mods. Some kill moves tend to freeze the character after they are finished, especially the strangle from behind. This is also a problem in vanilla skyrim. Some anmations are still failing sometimes although I removed most of the buggy animations. Danni for the idea and different tipps. kuertee for the excellent work with the script that detects game load. NaCross99 for the french translated string file. DJ_Kovrik, Bushin1, superrandombros28 for keeping this alive and fixing it.